Like all the Bedwyn men, Colonel Lord Aidan Bedwyn has a reputation for cool arrogance. But he is also a man to whom honor is more important than any other personal attribute–and it is this fierce loyalty that has brought him to Ringwood Manor to keep his promise to a dying fellow officer. He has sworn to protect the man’s sister no matter what–and it is a promise he intends to keep even when he finds that Miss Eve Morris wants no part of his protection and will not admit to even needing it. Finally, when Eve is about to be turned out of her home with all her friends and dependents, Aidan makes her an offer she cannot refuse. It is intended to be a simple, straightforward business arrangement–a few days in each other’s company and then a lifetime of happy independence apart. But they have reckoned without two powerful factors that conspire to wreck their plans–Aidan’s elder brother, the Duke of Bewcastle, and their own unwilling attraction to each other. Slightly Married is a masterpiece! 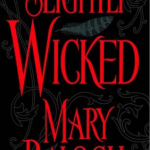 It is a tale of duty, honor, family, love, and passion, in which two lonely, independent people fall in love despite their best intentions… Mary Balogh has an unparalleled gift for creating complex, compelling characters who come alive on the pages and for conveying her characters’ deepest emotions. This book is a particularly emotional one… A large but well-drawn cast of secondary characters, including Eve’s family of “lame ducks” and the Bedwyn siblings, add depth and texture to this well-written, wonderfully romantic tale…. 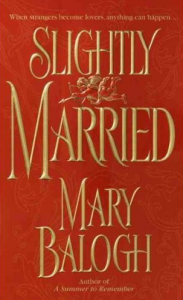 If you like marriage of convenience stories, or deeply emotional romances that tug at your heartstrings, with characters you will remember long after the last page is turned, I highly recommend Slightly Married. Eve Morris is enjoying a picnic with her aunt and other members of her household when she is summoned back to her home by a servant, who brings word that a military gentleman has arrived. She assumes that he is her brother, Percy, returning from Europe since Napoleon Bonaparte has recently been defeated and sent into captivity on the island of Elba. She races back to the house and arrives breathless and exuberant. This is the first encounter between Eve and Aidan. She dashed across the checkered floor of the hall, flung open the door of the visitors’ parlor, and hurried inside. “You wretch!” she cried, pulling undone the ribbon of her hat. And then she stopped dead in her tracks, feeling intense mortification. He was not Percy. He was a stranger. He was standing before the empty hearth, his back to it, facing the door. He seemed to half fill the room. He looked seven feet tall, dressed as he was in full regimentals, his scarlet coat and its gold facings immaculate, his white pantaloons spotless, his knee-high black cavalry boots polished to a high gloss, his sheathed sword gleaming at his side. He looked broad and solid and powerful and menacing. He had a harsh, weathered face, its darkness accentuated by black hair and eyebrows. It was a grim face, with hard, nearly black eyes, a great hooked nose, and thin, cruel-looking lips. He stared at her for a long moment before bowing. “Miss Morris, I presume?” he said. “Colonel Bedwyn at your service, ma’am,” he said. She recognized the name instantly. She could even supply the rest of it. He was Colonel Lord Aidan Bedwyn and Percy’s commanding officer. If she had felt deep mortification before, now she wished a black hole would open beneath her feet and swallow her up. But it did not take her longer than a moment to realize that embarrassment was the least of her concerns. He was Percy’s commanding officer. And he was standing in the visitors’ parlor at Ringwood in full, formal dress uniform. There was no need to ask why. In that instant she knew. Her head turned cold, as if all the blood had gushed downward out of it. Even the air in her nostrils felt icy cold. Unconsciously she let her hat fall to the floor and with both hands closed the door at her back, sought out the handle, and clung on tightly. “What can I do for you, Colonel?” She heard her voice now as if it came from a long way off. Percy. Her only brother, her only sibling, whom she had worshipped during childhood, adored fiercely through her girlhood, when he had been restless and rebellious and constantly at odds with Papa, and loved unwaveringly during the long years after he had gone away and then used the unexpected legacy left him by their maternal great-uncle to purchase a commission in a cavalry regiment. He had loved her cheerfully, generously in return. She had received a letter from him–from France–just two weeks ago. “He is dead?” He had been dead for almost a month and she had not known. She had not even sensed it. He had been two weeks dead when she read his letter, more than two weeks dead when James brought the news of victory and she had felt such enormous relief. “Did he suffer?” Foolish question. “It was extremely kind of you to honor such a request,” she said, realizing suddenly how strange it was that Percy’s commanding officer should come in person all the way from the south of France to inform her of his death. His eyes swept downward over her gray dress, which she was so looking forward to discarding for something more colorful, more in tune with the season in a week’s time. But it no longer mattered. Her brother was gone. Forever. She was engulfed in pain, blinded, deafened by it, by the unbearable agony of loss. “Ma’am?” The colonel took another half-step forward and reached out a hand as if to take her by the arm. “He asked me to protect you,” he said. “To protect me?” Her eyes flew to his face again. It was like granite, she thought. Without warmth, without expression, without sentiment. If there was a person behind the hard military facade, there was no sign of him. Though perhaps that was unfair. He had come close as if to aid her and had reached out a steadying hand. And he had come all the way from the south of France to repay a debt to Percy. He stepped to one side and pulled on the bell rope beside the door.Was she in shock? She felt perfectly in command of herself. She even wondered if that bell still worked since she could not recall the last time it had been used. She also realized that if it did work and if Agnes did answer it, she was going to have to move. She was still standing against the door, her hands clinging to the handle as if for very life. She did not believe she would be able to move if she tried. The universe would shatter into a billion fragments. Perhaps she really was not quite herself. Agnes answered the summons almost immediately. The colonel grasped Eve firmly by the upper arm just in time to move her to one side as the door opened. Eve sank obediently onto the closest chair and sat there, very upright, her spine not quite touching the back, her hands clasped tightly, painfully, in her lap. Poor Aunt Mari, she thought–tell her to hurry. Then she heard the echo of something else the colonel had said a minute or two ago. …you will inform me how I may be of service to you. How was it possible, she wondered, watching Agnes pick up her hat from the floor and hold it against her chest, frowning ferociously the while, to mouth mundane courtesies when Percy was dead? She felt the sharp pain of her fingernails digging into her palms. She had not offered him refreshments, she thought in the minute or two of silence that followed while Agnes stared at her and Colonel Bedwyn did not. He had taken up his stand before the hearth again, his back to it. She had not even offered him a seat. Aunt Mari, still wearing her hat, came hobbling into the room before any conversation could resume, her cane tapping out an urgent tattoo on the floor, her eyes wide with dismay, as if she already understood what this was all about. Charlie must have outdone himself in conveying a sense of doom. Eve swayed to her feet. “Oh, my poor love.” Aunt Mari came straight toward her and gathered her into her arms. Her cane clattered to the floor. Eve rested her forehead on her aunt’s bony shoulder for a weary spell, drawing comfort from the human touch of someone familiar, someone who loved her, someone who would make all better if she possibly could. But no one could make this better. No one could bring Percy back. Wretchedness enveloped her like a dark cloud. When she lifted her head again, her aunt’s eyes were filled with tears and her lips were wobbling in an effort to control her emotions. Muffin was standing at her feet, wagging his bit of a tail, looking soulful. Agnes still hovered just inside the room, clutching Eve’s hat and looking as if she would gladly fight a dragon or two if someone would only point her in the right direction. Thelma, her eyes wide with dismay, was there too, though there was no sign of the children. Nanny Johnson must have taken them upstairs. Colonel Lord Aidan Bedwyn had gone.